Layered nanomaterial has become a popular hierarchical material for amplifying chemiluminescence (CL) in recent years, mainly because of its ease of preparation and modification, large specific surface area, and high catalytic activity. In this review, we mainly discuss layered-nanomaterial-amplified CL systems based on graphene and its derivatives, layered double hydroxides, and clay. Detection mechanisms and strategies of layered-nanomaterial-amplified CL systems are provided to show the basic concepts for designing sensitive and selective sensing systems. Strategies for expanding the applications of layered-nanomaterial-amplified CL systems by combination with surfactants, quantum dots, organic dyes, and nanoparticles are introduced for the analysis of various analytes in real samples. The challenges and future trends of layered-nanomaterial-amplified CL systems are discussed at the end of the review. 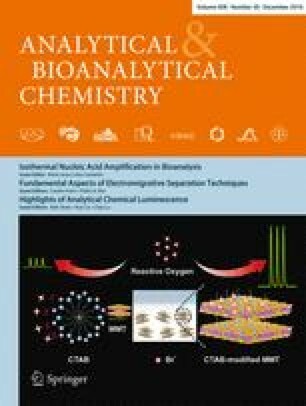 Published in the topical collection Highlights of Analytical Chemical Luminescence with guest editors Aldo Roda, Hua Cui, and Chao Lu. This work was supported by the National Basic Research Program of China (973 Program, 2014CB932103), the National Natural Science Foundation of China (21375006 and 21575010), and the Innovation and Promotion Project of Beijing University of Chemical Technology.